In an effort to provide a more thorough eye exam, our practice has incorporated the iWellnessExam SD – OCT retinal scan and Optomap – ultra-wide digital retinal imaging as part of your eye exam. Sight threatening diseases such as glaucoma, macular degeneration, diabetic retinopathy and others often have no outward signs or symptoms, which is why eye exams, including a thorough retinal evaluation, are important to protect vision. The new scan and photo provide Dr. Olund with more thorough information than a traditional exam and can enable her to diagnose some conditions and diseases earlier on, which can often lead to a better outcome. These two tests will become a part of your permanent patient record and will be reviewed with you by the doctor during your exam. The $39 charge is typically not covered by your medical or vision insurance unless being used to actively follow disease. This cost will be added into the price of your visit. 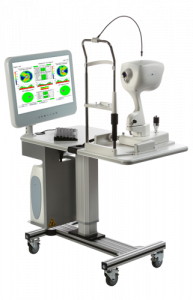 The Optomap, or Optos, utilizes ultra-widefield retinal imaging to provide a 200° view of the retina. This a larger field than what can be seen through traditional ophthalmoscopy. This enables Dr. Olund to view and diagnose certain conditions, such as a retinal tear in the periphery, earlier than with a traditional exam. As with a retinal tear, oftentimes early detection is crucial in providing treatment before a condition progresses to the extent the patient begins experiencing negative symptoms or sight loss. Additionally, the image is stored from year to year which enables Dr. Olund to monitor even small changes in features such as a nevus (mole) or within the blood vessels. 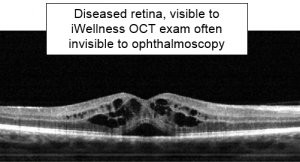 The iWellness Screening utilizes Optical Coherence Tomography, or OCT, to obtain a more detailed view beyond the surface of the retina. The OCT is a non-invasive imaging test that uses light waves to take cross-section pictures of your retina, the light-sensitive tissue lining the back of the eye. With the OCT, each of the retina’s distinctive layers can be seen, allowing Dr. Olund to map and measure their thickness. These measurements help with diagnosis and provide treatment guidance for Glaucoma and retinal diseases, such as ARMD (age-related macular degeneration) and diabetic eye disease.